Since the dawn of the Industrial Revolution, self-interest has been the driving force of economic activities worldwide. Wealth creation for some regions has been put to the focus, whereas the world is already running out of resources. At the same time, more and more people are suffering from drastic working conditions only to cover their basic needs. Many countries are facing the challenge of their rising population, high unemployment rate, and growing poverty. Besides, corruption, injustice, and discrimination in working environments are creating vulnerable employment conditions and barriers to an inclusive, sustainable economic growth. According to the World Employment and Social Outlook: Trends 2018, a report by the International Labor Organization (ILO), the global unemployment rate is expected to fall slightly from 5.6% in 2017 to 5.5% in 2018. However, with a growing number of people entering the labor market, the total number of unemployed, which is above 192 million, is expected to remain stable in 2018. Also in Egypt, the unemployment rate has a slight drop in 2017 (from 12.25% to 11.8%). Still, the gap between females’ unemployment rate (23.1%) and that of males (8.2%) remains high, according to the last annual report of the Central Agency for Public Mobilization and Stability (CAPMAS). However, the biggest economic challenge in Egypt is still the high inflation rate, which reached its highest record since many decades, with an average of 23.5% in 2017. After the big hit to the Egyptian economic situation by three consecutive currency devaluations in 2016, the net income of the Egyptians has shrunk constantly, which is affecting the economic well-being and quality of life. But there is also good news! In another report (World Employment and Social Outlook 2018: Greening with Jobs) the ILO predicts that 24 million new jobs will be created globally by 2030 if the right policies to promote a greener economy will take place. 18 million of the estimated new jobs will arise by adopting sustainable practices in the energy sector; 6 million others by promoting circular economy in regard to the use of resources use and consumption. 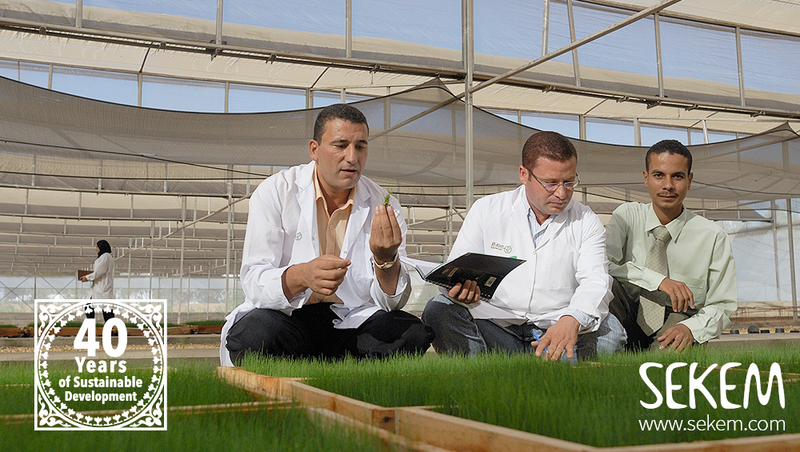 Organic seedling production at El-Mizan, SEKEMs company for grafting plants. And it seems that more and more companies and organizations become aware of the meaning of such a sustainable economic system and start implementing concrete steps towards realizing SDG 8: Decent Work and Economic Growth. SEKEM has integrated the 8th Sustainable Development Goal already in its vision 40 years ago: “Sustainable Development towards a future where all economic activity is conducted in accordance with ecological and ethical principles.” And it worth it – also financial vice! 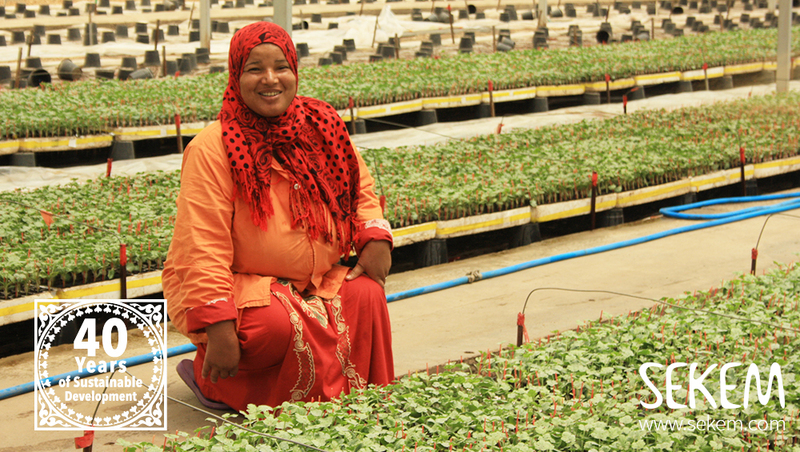 With more than 1500 employees, and in cooperation with over 800 farmers all over Egypt, SEKEM’s manufactures products that guarantee a fair share for all involved parties. The Egyptian initiative ensures social and cultural development opportunities through its holistic “Economy of Love” concept and a transparent value chain. For instance, an Impact Evaluation Study, conducted by SEKEM’s partner Oikocredit in 2015 shows that SEKEM’s contracted farmers benefit from higher incomes, guaranteed markets, and better working conditions. On the other hand, the research also indicated to deficits in regard to gender equality. For this reason, SEKEM launched a “Gender Strategy for a Balance Society” which summarizes the initiative’s efforts in all institutions and activity field to strengthen women and support equal rights and opportunities. Hence, SEKEM offers, for instance, a female-friendly working environment, flexible working hours to young parents or newborns and child care facilities. SEKEM co-workers at NatureTex for Ogranic textiles and garments. By SEKEMs sustainable economic growth, within the past 40 years, more than 2000 direct jobs were created which accumulated around 5 Million Euro net present value. Besides, around 8000 community members have affiliated that benefit from the local health and education infrastructure offered by SEKEM – thereby approximately 14 million Euro net present value could be accumulated by savings. Fair and decent economic activities do hence also pay out financial vice. For this reason, and despite the current challenges Egypt’s economic system is facing, SEKEM is convinced that it is possible to realize Sustainable Development Goal No. 8 “Decent Work and Economic Growth” in the country – especially when like-minded partners work hand in hand on that goal. Since the beginnings in 1977, SEKEM Initiative is carried by such like-minded people; partners and supporters that are not only heading together towards creating a holistic economic approach but who also share the same intention. “Behind all our efforts for a solidary economy, responsible dealing with nature and the development of people, there is always the target of promoting a sustainable community, which is based on common values: A vision community,” Helmy Abouleish, SEKEM’s CEO, explains the intention. SEKEM is working on that mission also on international level. Recently the initiative participated in drafting a “Charter for an Associative Economy for the Organic Market” together with the Demeter Association and many other committed institutions. Thereby sustainable socioeconomics based on transparent, fruitful cooperation between all members of the value creation shall be realized. 40 years ago, SEKEM was founded with the idea of sustainable development and building of a prosperous future for Egypt and the world. For SEKEM, sustainable development is not a fancy topic to talk about, but the core business. SEKEM commits itself to the “2030 Agenda for Sustainable Development” and works to fulfill all 17 SDGs. SEKEMmeasures its holistic concept with the Sustainability Flower. The flower represents a management, assessment and communication tool symbolizing the concept of sustainable development in its four dimensions: economic life, societal life, cultural life, and ecology.